Peace December International in partnership with African American Women In Cinema hosted a black-tie benefit for the Mama Sarah Obama Foundation (MSOF) in New York City. The goal for this fundraiser was to secure support for MSOF, whose mission is to improve the education and welfare of disenfranchised children in order to help them successfully achieve their goals and have a better future. Specifically, the monies raised will accelerate efforts to rehabilitate and refurbish as well as expand the primary school named Senator Barack Obama in Kongelo village in Kenya. The school will provide early, primary, and secondary education. The total amount for the completion of the school is an estimated $2.5 million (USD). Their goal is to secure a minimum of $250,000 so the Foundation can complete the rehabilitation and begin the expansion. MSOF’s vision is a world where children are nurtured and supported physically, educationally, and emotionally to thrive and succeed in life. With the AIDS epidemic ravaging sub-Sahara Africa in the last three decades and leaving many children without parents, Mama Sarah Obama turned her attention to addressing the educational and welfare needs of orphans in Kogelo village. She used her own resources and relentlessly worked with community leaders to meet the dire needs of these orphans. 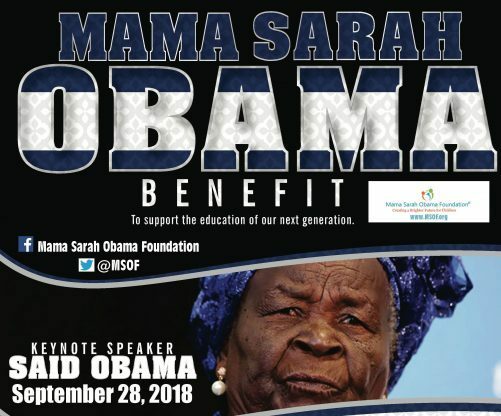 In 2009, the Mama Sarah Obama Foundation was formed. Check out our recap of the fundraising benefit that took place in Harlem, NY.